Swatches: BGirl Glittery Nail Polishes Bornprettystore | Memorable Days : Beauty Blog - Korean Beauty, European, American Product Reviews. Hello Monday! Yes it's Monday already... In case you were wondering about the winner of the Candysan giveaway, it was announced yesterday! Make sure to check if you are the winner (go to blogpost). Today i'm going to share some swatches of a few nail polishes that I received from Bornprettystore.com. It's from the brand Bgirl and it comes in a set of 4 nail polishes. These are called the sparkle yoghurt milky glitter nail polishes, what a long name but you will see at the swatches why they called it this way. Keep on reading! I got it from bornprettystore.com (link to product) and it's sold for $7.99. You will get this set with 4 mini nail polishes. They offer worldwide free shipping without a minimum order which is definitely a plus! Also, feel free to use my coupon code MDJ61 to get 10% OFF at checkout! In this set you can find 4 colors: sky blue, apricot, pastel green and a lilac color. I had to apply 2 coats in order to get a good finish. They look super cute and my favorite out of the 4 gotta be the lilac color ^^. 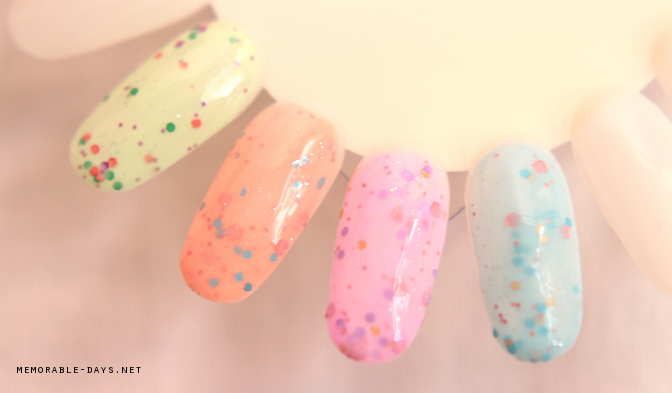 I like the name of this set as well: "sparkle yoghurt milky glittery nail polishes", since it really suit the nail polishes. Unfortunately these are a bit hard to remove since it contains glitters and it really has a strong nail polish scent when you open the bottle. Overall, i think these nail polishes are cute, the quality is ok and the price is not bad since you will get 4 nail polishes :). note: this set was sponsored and this blogpost contains affiliate links.